Canon today launch their lightest digital SLR to date, the EOS 1000D, which incorporates a range of technologies used in Canon’s professional EOS-1 series cameras. 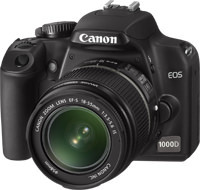 United Kingdom / Republic of Ireland, 10 June 2008: Canon today announces its latest D-SLR, the EOS 1000D. Featuring a 10.1 Megapixel CMOS sensor, 7-point wide area AF system and up to 3fps continuous JPEG shooting until the memory card is full (Limited to size of individual SD card used), the EOS 1000D represents a more affordable entry point to the world of EOS cameras – whilst taking full advantage of over 70 years of imaging expertise. With the lightest body of any digital EOS camera, the EOS 1000D incorporates a range of technologies used in Canon’s professional EOS-1 series cameras, including the DIGIC III image processor, and Live View mode. For straight-from-the-box shooting, the EOS 1000D is available with a Canon EF-S 18-55mm IS lens – which includes 4-stop image stabilisation, ensuring superb performance even in low-light conditions. EOS 1000D 18-55mm IS lens kit £579.99 / €749.99 RRP inc. VAT. As with all EOS models, key components for the EOS 1000D are designed and manufactured in-house to work with each other for the ultimate image quality. A 10.1 Megapixel CMOS sensor – with larger pixels for smooth, low-noise images – offers sufficient resolution to produce prints in sizes up to A4, even when cropping your image. To protect images against the effects of sensor dust, the EOS 1000D includes the EOS Integrated Cleaning System, which combats dust in three separate ways: reducing, removing and repelling. The EOS 1000D also features a DIGIC III image processor, as used in Canon’s professional D-SLR models. This allows continuous shooting until the SD or SDHC memory card is full, at speeds of up to 3fps (3fps when shooting JPEG, 1.5fps RAW. See specifications for details) – with the number of shots limited only by the size of the card. DIGIC III also delivers superior image rendering, rapid operation and virtually instant start-up times. For shots where fast focusing is needed, the EOS 1000D features a 7-point wide area Auto Focus system, capable of locking onto a subject in a fraction of a second. A cross-type central focus point continues to operate effectively even when used in lower-light and lower-contrast settings. Also included is E-TTL II, Canon’s distance-linked flash exposure system found in professional EOS models. Weighing just 450g, the EOS 1000D is Canon’s lightest D-SLR to date, with a compact, ergonomic body designed for comfortable handling. A bright 2.5” LCD screen lets users instantly review images for composition, sharpness and focus – or, thanks to a wide viewing angle, instantly share shots with friends. The LCD also provides access to a fast, easy-to-read menu system, which uses tabs to avoid unnecessary scrolling. Inherited from the latest EOS models, the menu system includes direct control over external devices such as Speedlite flash units. Photo quality in every situation is aided by 12 custom functions, including Auto Lighting Optimizer - which corrects brightness and contrast during image processing, while improving skin tones in portraits by ensuring correct exposure for faces. Photographers can also enable additional noise reduction for shots captured at high ISO speeds. For shooting situations where using the viewfinder is impractical – or where a tripod is used – users can switch to Live View mode, which displays the scene as a smooth, 30fps video feed on the LCD. An optional grid line and histogram display can be selected to help with shot composition and exposure. Two AF modes are available for use with Live View: Quick AF, which momentarily flips the camera’s mirror to engage the AF sensor, and Live AF, which uses contrast information for compact camera-style focusing. The EOS 1000D is supplied with a comprehensive software suite that provides all the necessary tools for managing and processing images. This includes Digital Photo Professional (DPP), a powerful RAW converter that provides complete RAW image processing control. DPP also integrates with camera features such as Dust Delete Data and Picture Styles. The supplied Picture Style Editor software can be used to create custom Picture Styles for fine control over colour display. The camera also comes with EOS Utility, Image/Zoom Browser and Photostitch. Despite the press release Canon seem to have pulled the page from their site or the link is broken. Super budget DSLR? Sure to appeal to a lot of people wanting their first DSLR. EOS 1000D rumour been kicking about for fair time. Another DSLR from Canon with SD and SDHC and no CF, should we be concerned about buying further CF cards if we might have to bin them with future upgrades? Could this ne the beginning of the end of CF? [quote]Another DSLR from Canon with SD and SDHC and no CF, should we be concerned about buying further CF cards if we might have to bin them with future upgrades? Could this ne the beginning of the end of CF? [/quote] Using SD or SDHC in an entry level camera makes sense (especially one like this). It keeps the size down (and thus the weight) and it saves those coming from 'point and shoots' having to invest in new cards. The pro cameras will continue to use CF due to superior size and speed. I don't see this as any indication of the future of CF. Quote:Another DSLR from Canon with SD and SDHC and no CF, should we be concerned about buying further CF cards if we might have to bin them with future upgrades? Using SD or SDHC in an entry level camera makes sense (especially one like this). It keeps the size down (and thus the weight) and it saves those coming from 'point and shoots' having to invest in new cards. The pro cameras will continue to use CF due to superior size and speed. I don't see this as any indication of the future of CF. Some valid points above. On the grand scheme of things does a few grams difference between SD and CF cards help much with weight saving? My mine gripe is the starting price versus spec. I'd never used an SLR before buying a 400D last August and now you can get them for £380 or so, even a 450D for £484 with the 18-55 IS lens, will anyone want to pay £499 for body only or £579 with the IS lens?? If you could pick up an EOS1000D and use it "straight from the box" then I'd dare say you could use a 400D or 450D straight away too. I hear what you are saying re the cards - what I meant was that the CF is a physically larger device and therefore the camera body has to be larger (and heavier) to accomodate it. The main reason for this camera 'appears' to be its size/weight, so this is an important consideration. As you say, I'm not sure about the comparative prices... similar to the whole Nikon D60 vs D40/D40x debate. I hear what you are saying re the cards - what I meant was that the CF is a physically larger device and therefore the camera body has to be larger (and heavier) to accomodate it. The main reason for this camera 'appears' to be its size/weight, so this is an important consideration. As you say, I'm not sure about the comparative prices... similar to the whole Nikon D60 vs D40/D40x debate. I'm sorry but the price is all wrong, Metalhead point is true, why spend £499 on a 1000D when you can get a 450D for around the same price. I think that Canon have made an error in the press release and the price should read £399 body only. I'm sorry but the price is all wrong, Metalhead point is true, why spend £499 on a 1000D when you can get a 450D for around the same price. I think that Canon have made an error in the press release and the price should read £399 body only. The price does seem way too hight for it's intended market. Half the price and I would be impressed. Tha canon site quotes SRP £499 for the 1000D and £600 for the 450D so I would think prices would actually be less. [quote]Quote:Another DSLR from Canon with SD and SDHC and no CF, should we be concerned about buying further CF cards if we might have to bin them with future upgrades? Could this ne the beginning of the end of CF?Using SD or SDHC in an entry level camera makes sense (especially one like this). It keeps the size down (and thus the weight) and it saves those coming from 'point and shoots' having to invest in new cards. The pro cameras will continue to use CF due to superior size and speed. I don't see this as any indication of the future of CF. [/quote] Fair point, I was just mumbling out loud, but can see the possibility of SD being the way forward with its supposed higher max capacity and no pins to bend, time will tell I guess. I don’t know about the speed, I have read contrasting reports as to which is or can be faster, depends how you bench the tests I guess. I think that is the RRP price, which is always lower at retail level, no one is going to buy the 1000D if you can get the 450D for the same. Quote:Quote:Another DSLR from Canon with SD and SDHC and no CF, should we be concerned about buying further CF cards if we might have to bin them with future upgrades? Could this ne the beginning of the end of CF?Using SD or SDHC in an entry level camera makes sense (especially one like this). It keeps the size down (and thus the weight) and it saves those coming from 'point and shoots' having to invest in new cards. The pro cameras will continue to use CF due to superior size and speed. I don't see this as any indication of the future of CF. Fair point, I was just mumbling out loud, but can see the possibility of SD being the way forward with its supposed higher max capacity and no pins to bend, time will tell I guess. I don’t know about the speed, I have read contrasting reports as to which is or can be faster, depends how you bench the tests I guess. I think that is the RRP price, which is always lower at retail level, no one is going to buy the 1000D if you can get the 450D for the same. I think the real price will be lower. Pity its not offered as a kit with an 18-200 or so superzoom, I don't know how small it is (?) but it could rival a lot of bridge cameras. Even with a cheapo plastic lens. I think the real price will be lower. Pity its not offered as a kit with an 18-200 or so superzoom, I don't know how small it is (?) but it could rival a lot of bridge cameras. Even with a cheapo plastic lens. Looks like canon are beginning to look around the corner and embrace old technology such as contrast af in live view. However canon are still lights years behind in Auto white balance under incandescent light< i wonder if they have produced yet another "entry" level dslr that requires pro knowledge to avoid yellow images under tungsten light ?